The Untouchables is an American crime drama that ran from 1959 to 1963 on the ABC Television Network, produced by Desilu Productions. Based on the memoir of the same name by Eliot Ness and Oscar Fraley, it fictionalized Ness's experiences as a Prohibition agent, fighting crime in Chicago in the 1930s with the help of a special team of agents handpicked for their courage, moral character, and incorruptibility, nicknamed the Untouchables. The book was later made into a film in 1987 (also called The Untouchables) by Brian De Palma, with a script by David Mamet, and a second, less-successful TV series in 1993. A dynamic, hard-hitting action drama, and a landmark television crime series, The Untouchables won series star Robert Stack an Emmy Award for Best Actor in a Dramatic Series in 1960. Photo of the cast for The Untouchables as seen on Desilu Playhouse: Only Robert Stack (third from left) and Abel Fernandez (second from right) were used in the actual television series. Keenan Wynn is seen here at the right of Robert Stack, Peter Leeds (who played LaMarr Kane, replaced in the series by Chuck Hicks) is to the right of Wynn, and TV's Kit Carson, Bill Williams as Marty Flaherty (replaced by Jerry Paris in the series), is on the far right. Actor Paul Dubov, who played Jack Rossman (replaced in the series by Steve London), is missing from this photo. The series originally focused on the efforts of a real-life squad of Prohibition agents employed by the United States Department of the Treasury and led by Eliot Ness (Stack), that helped bring down the bootleg empire of "Scarface" Al Capone, as described in Ness's bestselling 1957 memoir. This squad was nicknamed "The Untouchables", because of their courage and honesty; they could not be bribed or intimidated by the Mob. Eliot Ness himself had died suddenly in May 1957, shortly before his memoir and the subsequent TV adaptation were to bring him fame beyond any he experienced in his lifetime. The pilot for the series was a two-part episode entitled "The Untouchables" originally aired on CBS's Westinghouse Desilu Playhouse on April 20 and 27, 1959. Later retitled "The Scarface Mob", these episodes, which featured Neville Brand as Al Capone, were the only episodes in the series to be more-or-less directly based on Ness's memoir, and ended with the conviction and imprisonment of Capone. CBS, which had broadcast most of Desilu's television output since 1951 beginning with I Love Lucy, was offered the new series following the success of the pilot film. Chairman William S. Paley rejected it on the advice of network vice president Hubbell Robinson. ABC agreed to air the series, and The Untouchables premiered on October 15, 1959. In the pilot movie, the mobsters generally spoke with unrealistic pseudo-Italian accents, but this idiosyncratic pronunciation was dropped when the series debuted. The weekly series first followed the premise of a power struggle to establish a new boss in Capone's absence (for the purpose of the TV series, the new boss was Frank Nitti, although this was contrary to fact). As the series continued, there developed a highly fictionalized portrayal of Ness and his crew as all-purpose crime fighters who went up against an array of gangsters and villains of the 1930s, including Ma Barker, Dutch Schultz, Bugs Moran, Vincent "Mad Dog" Coll, Legs Diamond, Lucky Luciano, and in one episode, Nazi agents. The terse narration by gossip columnist Walter Winchell, in his distinctive New York accent, was a stylistic hallmark of the series, along with its melancholy theme music by Nelson Riddle and its shadowy black-and-white photography, influenced by film noir. The show drew harsh criticism from some Italian-Americans, including Frank Sinatra, who felt it promoted negative stereotypes of them as mobsters and gangsters. The Capone family unsuccessfully sued CBS, Desilu Productions, and Westinghouse Electric Corporation for their depiction of the Capone family. In the first episode of the first season, the character of "Agent (Rico) Rossi", a person of Italian extraction who had witnessed a gangland murder, was added to Ness's team. There will be no more fictional hoodlums with Italian names in future productions. There will be more stress on the law-enforcement role of "Rico Rossi", Ness's right-hand man on the show. There will be an emphasis on the "formidable influence" of Italian-American officials in reducing crime and an emphasis on the "great contributions" made to American culture by Americans of Italian descent. The series also incurred the displeasure of the powerful director of the Federal Bureau of Investigation, J. Edgar Hoover, when the fictionalized scripts depicted Ness and his Treasury agents involved in operations that were actually the province of the FBI. The second episode of the series, for example, depicted Ness and his crew involved in the capture of the Ma Barker gang, an incident in which the real-life Ness played no part. The producers agreed to insert a spoken disclaimer on future broadcasts of the episode stating that the FBI had primary responsibility for the Barker case. The Untouchables was an unusually violent program for its time and its excessive violence and surprisingly frank depictions of drug abuse and prostitution were described by the National Association for Better Radio and Television as "not fit for the television screen". In an article titled "The New Enemies of 'The Untouchables'" Ayn Rand argued that the persistent, superficial attacks received by The Untouchables were due to its appeal and its virtues: its moral conflict and moral purpose. The series had 118 episodes which ran 50 minutes each. Though the book chronicled the experiences of Ness and his cohorts against Capone, and in reality the Untouchables disbanded soon after Capone's conviction, the series continued after the pilot and book ended, depicting the fictitious further exploits of the Untouchables against many, often real life, criminals over a span of time ranging from 1929 to 1935. The television episodes were broadcast in no chronological timeline, but were set mostly in the early 1930s (for example, one episode, "You Can't Pick the Number", begins with Winchell's words, "October 1932: the depth of the Depression"), and another episode "Canada Run" begins at Chicago Stadium at the NFL Playoff Game on December 18th 1932. A few episodes were set primarily in a locale other than Chicago (such as the one dealing with the shootout involving Ma Barker and her gang.) Characters and "facts" in the majority of the episodes were more often than not entirely fictitious or loosely based composites of true-life criminals of that era. The gripping theme music was by Nelson Riddle. Quinn Martin produced the show's first season, which contained elements that could be found in future TV series produced by Martin. Joe Kulak, portrayed by Oscar Beregi, Jr.
Paul Picerni and Nicholas Georgiade were cast as gangsters in Capone and Nitti's mob in the 1959 pilot before being cast in the series. * Steve London's character of Untouchable Jack Rossman (played in the "Scarface Mob" pilot by Paul Dubov), was in the series since the original season-one series episode, "The Empty Chair", not from season two on as is commonly reported. ** The character of Untouchable William Youngfellow, portrayed by Abel Fernandez, has been mistakenly referred to by Saturday Night Live actor Dan Aykroyd as "Youngblood". This name is incorrect. Luther Adler in S2E3 "Nicky", S2E22 "Murder Under Glass", S3E17 "Takeover"
Richard Anderson in S1E28 "The Frank Nitti Story"
Michael Ansara in S2E3 "Nicky" and S2E16 "The Jamaica Ginger Story"
Edward Asner as Frank in two episodes, S4E8 "Elegy", S4E13 "Search for A Dead Man", also S3E16 "The Death Tree", S4E1 "The Night They Shot Santa Claus"
Jim Backus in S1E15 "Star Witness"
Martin Balsam in S3E3 "Tunnel of Horrors", S3E21 "Man in the Middle"
William Bendix in S1E9 "The Tri State Gang"
Whit Bissell in S1E11 "You Can't Pick the Number"
Joan Blondell in S2E18 "The Underground Court"
Charles Bronson in S3E16 "The Death Tree"
Victor Buono as Melanthos Moon in S2E25 "Mr. Moon" and as Parnise Surigao in S3E13 "The Gang War"
James Caan in S4E10 "A Fist of Five"
Anthony Caruso in S1E13 "Syndicate Sanctuary"
Phyllis Coates in S1E5 "Ain't We Got Fun", S1E28 "The Frank Nitti Story", and S4E10 "A Fist of Five"
James Coburn in S2E16 "The Jamaica Ginger Story"
Mike Connors in S4E7 "The Eddie O'Gara Story"
Richard Conte in S2E15 "The Organization", S4E3 "The Chess Game"
Robert Duvall in S4E17 "Blues for a Gone Goose"
Peter Falk in S1E26 "The Underworld Bank", as Nate Selko in S3E1 "The Troubleshooter"
Anne Francis in S1E24 "The Doreen Maney Story"
Harry Guardino in S1E17 "One-Armed Bandits", S2E19 "The Nick Moses Story", S3E25 "The Contract"
Connie Hines in S1E24 "The Doreen Maney Story"
Brian Keith in S2E16 "The Jamaica Ginger Story"
George Kennedy as 'Birdie' the mute in S2E30 "The King of Champagne"
Jack Klugman in S3E6 "Loophole", S4E19 "An Eye for an Eye"
Gail Kobe in S1E13 "Syndicate Sanctuary", S4E28 "The Torpedo"
Martin Landau in S1E7 "Mexican Stake-Out", S3E6 "Loophole"
Cloris Leachman in S3E7 "Jigsaw", S3E21 "Man in the Middle"
Jack Lord in S1E3 "The Jake Lingle Killing"
Lee Marvin in S2E31 "The Nick Acropolis Story", S3E19 "Element of Danger", S4E10 "A Fist of Five"
Elizabeth Montgomery as Rusty Heller (received an Emmy Award nomination, 1960) S2E1 "The Rusty Heller Story"
Harry Morgan as Bugs Moran in S4E12 "Doublecross"
Vic Morrow in S2E11 "The Tommy Karpeles Story", S3E20 "The Maggie Storm Story"
J. Carrol Naish in S1E14 "The Noise of Death"
Patricia Neal in S3E20 "The Maggie Storm Story"
Leslie Nielsen in S1E23 "Three Thousand Suspects"
Leonard Nimoy in S3E17 "Takeover"
Warren Oates in S3E26 "Pressure"
Carroll O'Connor in S3E2 "Power Play", S4E6 "Bird in the Hand"
Susan Oliver in S2E15 "The Organization"
Nehemiah Persoff as Jake "Greasy Thumb" Guzik in three episodes, S1E1 "The Empty Chair", S2E29 "The Seventh Vote", S4E12 "Doublecross", also S1E27 "Head of Fire- Feet of Clay", S2E4 "The Waxey Gordon Story", S3E18 "The Stryker Brothers"
Robert Redford in S4E15 "Snowball"
Madlyn Rhue in S1E27 "Head of Fire- Feet of Clay", S2E11 "The Tommy Karpeles Story"
Cliff Robertson in S1E12 "The Underground Railway"
Telly Savalas in S2E20 "The Antidote", S3E5 "The Matt Bass Scheme", S4E14 "The Speculator"
Henry Silva as Little Charlie Sebastino in two episodes, S1E14 "The Noise of Death", S2E5 "The Mark of Cain", also S3E15 "The Whitey Steele Story"
Barbara Stanwyck as Lt. Agatha Stewart in S4E8 "Elegy", S4E13 "Search for a Dead Man"
Rip Torn as aka "Pittsburgh Phil" in S2E14 "The Masterpiece", S4E23 "The Spoiler"
Claire Trevor as Ma Barker in S1E2 "Ma Barker and her Boys"
Jack Warden in S1E3 "The George 'Bugs' Moran Story", S1E27 "Head of Fire-Feet of Clay", S2E10 "The Otto Frick Story"
The Untouchables originally aired as a segment of the anthology series Desilu Playhouse in 1959. It was picked up as a regular series by ABC for the 1959 season and was aired on Thursdays from 9:30 to 10:30pm from 1959 to 1962, switching to Tuesday evenings from 9:30 to 10:30pm for its final season (1962-63). Desilu Productions president Desi Arnaz had originally offered the role of Ness to Van Johnson. Johnson's wife and manager rejected the deal, and demanded double the salary offer. Arnaz refused and signed Stack, instead. Arnaz had had a long business relationship with CBS, which had aired many Desilu programs, including I Love Lucy and The Lucy-Desi Comedy Hour. When CBS refused to buy the program, Arnaz sold it to ABC. In 1961, Neville Brand reprised his role as Al Capone in the movie The George Raft Story. Some segments were released to theaters as movies: The Scarface Mob (from the two-part pilot), The Alcatraz Express (from "The Big Train"), and The Gun of Zangara (from "Unhired Assassin"). On November 10, 1991, NBC ran the two-hour movie The Return of Eliot Ness, with Robert Stack as Ness. It was set in 1947, after Capone's death, and depicted Ness investigating the death of an Untouchables agent named Labine. 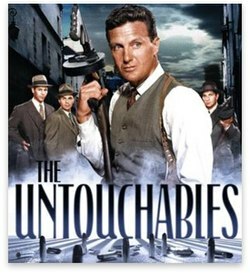 The Untouchables was a landmark television series, that has spawned numerous imitators over the decades, such as S.W.A.T., The F.B.I., Crime Story, the original Hawaii Five-O (Five-O's creator and executive producer, Leonard Freeman, served as executive producer on The Untouchables' final season), Robert Stack's two later series, Strike Force and Most Wanted, The Hat Squad, and the 1993 The Untouchables syndicated TV series. It also inspired the big-budget motion pictures Al Capone starring Rod Steiger, The Untouchables (with Kevin Costner), Gangster Squad, Mulholland Falls, and others.The Untouchables is one of two series from 1959, the other being The Detectives, together credited with the concept of depicting a group of crime fighters. Previously, most TV crime dramas had followed one of two formats: either a duo composed of a stalwart police officer or detective and his trusty sidekick/partner (Dragnet, The Lineup), or a lone-wolf private eye or police detective (Peter Gunn, Richard Diamond, M-Squad). The series was spoofed in the 1963 Merrie Melodies cartoon short "The Unmentionables", with Bugs Bunny playing the role of Elegant Mess, a crime fighter who is assigned to infiltrate a black market ring operated by Rocky and Mugsy. The series was also spoofed on an episode of the 1961-62 ABC-TV/Hanna Barbara cartoon series Top Cat entitled "The Unscratchables". NBC's "Saturday Night Live" spoofed The Untouchables several times during the 1970s, with Dan Aykroyd playing Eliot Ness. In their 1988 book, The Critics' Choice—The Best of Crime and Detective TV, authors Max Allan Collins and John Javna chose The Untouchables as one of the "Top 10 Best Police TV Series (Police Procedurals) of All Time". The Lebanon (Pa.) Daily News said of The Untouchables: "Between the hard-nosed approach, sharp dialogue, and a commendably crisp pace (something rare in dramatic TV at the time), this series is one of the few that remains fresh and vibrant. Only the monochrome presentation betrays its age. The Untouchables is one of the few Golden Age TV shows that deserves being called a classic." In 1997, the episode "The Rusty Heller Story" was ranked number 99 on TV Guide's 100 Greatest Episodes of All Time. CBS DVD (distributed by Paramount Home Entertainment) have released all four seasons of The Untouchables on DVD in region 1, all digitally remastered from the original negatives and presented uncut, unedited and in its original broadcast order. The first two seasons have also been released in region 4. On May 10, 2016, CBS DVD released The Untouchables- The Complete Series on DVD in Region 1. Paramount Home Entertainment has released the first three seasons of The Untouchables on DVD in the UK. These releases are full-season sets as opposed to Region 1 and 4 where each season has been split into two volumes. The complete series (all 4 seasons) was released on DVD in the UK on May 29, 2017 by Medium Rare Entertainment. The TV show was also adapted into a comic book by Dan Spiegle, distributed by Dell Comics. ^ "Robert Stack". Movies.yahoo.com. April 20, 2011. Archived from the original on October 18, 2015. Retrieved 2015-10-12. ^ "YouTube". YouTube. Retrieved 2015-10-12. ^ James Mannion. "The Everything Mafia Book: True Life Accounts of Legendary Figures, Infamous ..." Books.google.com. p. 47. Retrieved 2015-10-12. ^ "About.com". Netplaces.com. July 25, 2011. Archived from the original on April 13, 2015. Retrieved October 12, 2015. ^ Ayn Rand. "The Ayn Rand Column". AynRand.org. Retrieved 2015-10-12. ^ Etter, Jonathan. Quinn Martin, Producer. Jefferson: McFarland, 2003. ^ "SNL Transcripts: Desi Arnaz: 02/21/76: The Untouchables". Snltranscripts.jt.org. February 21, 1936. Retrieved 2015-10-12. ^ "Crime Story". Culttvstore.com. Retrieved 2015-10-12. ^ Max Allan Collins; John Javna. The Best of Crime & Detective Tv the Critics' Choice. Crown Publishers, Inc. ISBN 0-517-57055-6. ^ Max Allan Collins; John Javna. The Best of Crime & Detective TV (The Critics' Choice). Amazon.com. ISBN 9780517570555. Retrieved 2015-10-12. ^ Long, Harry H. "From Reel to Disc: 'Gunsmoke' simplistic tale of good versus evil – Lebanon Daily News". Ldnews.com. Archived from the original on October 18, 2015. Retrieved 2015-10-12. ^ "The Untouchables – Season 1, Vol. 1: Robert Stack, Walter Winchell, Nicholas Georgiade, Paul Picerni, Abel Fernandez, Steve London, Bruce Gordon, Frank Wilcox, Gene Coogan, Michael Jeffers, Robert Bice, Kenner G. Kemp, Bert Granet". Amazon.com. Retrieved 2015-10-12. ^ "The Untouchables – Season 1, Vol. 2". Amazon.com. Retrieved 2015-10-12. ^ "The Untouchables: Season 2, Vol. 1: Robert Stack, Bruce Gordon, Neville Brand, Paul Picerni, Robert F. Simon, Abel Fernandez, Nicholas Georgiade, Steve London, Richard Carlyle, Lalo Rios, Lewis Charles, Gavin MacLeod, Don Medford, Herman Hoffman, John Peyser, Paul Wendkos, Stuart Rosenberg, Walter Grauman, Adrian Spies, Charles O'Neal". Amazon.com. Retrieved 2015-10-12. ^ "The Untouchables: Season 2 Volume 2: Robert Stack, Paul Picerni, Nicholas Georgiade, Abel Fernandez, Steve London". Amazon.com. Retrieved 2015-10-12. ^ "The Untouchables: Season 3 Volume 1: Robert Stack, Walter Winchell, Nicholas Georgiade, Paul Picerni, Abel Fernandez". Amazon.com. Retrieved 2015-10-12. ^ "The Untouchables: Season 3 Volume 2: Robert Stack, Walter Winchell, Nicholas Georgiade, Paul Picerni, Abel Fernandez". Amazon.com. Retrieved 2015-10-12. ^ "The Untouchables – Season 1: Volumes 1 and 2 DVD 1959: Amazon.co.uk: Robert Stack". Amazon.co.uk. Retrieved 2015-10-12. ^ "The Untouchables: Season 2 DVD: Amazon.co.uk: Robert Stack, Nicholas Georgiade, Abel Fernandez, Steve London, Bruce Gordon, Jerry Paris, Frank Wilcox, Barry Russo". Amazon.co.uk. Retrieved 2015-10-12. ^ "Untouchables: Complete Season 3 DVD: Amazon.co.uk: Robert Stack, Walter Winchell, Nicholas Georgiade, Paul Picerni, Abel Fernandez". Amazon.co.uk. Retrieved 2015-10-12. Wikimedia Commons has media related to The Untouchables (1959 TV series).